We look forward to giving you a great time on a full day tour, Thursday May 19th 2005 at the CWSF! The West Coast of British Columbia offers many interesting experiences and the CWSF 2005 tour committee is pleased to show you several of these. Some tour options are described here. Details are subject to change. 1. Travel by ferry across the Strait of Georgia, through the beautiful Gulf Islands, to Victoria, the capital city of B.C. There you will visit the Royal B.C. Museum to view their many fabulous exhibits depicting B.C.’s colourful history. Enroute you will stop at the Centre of the Universe with a giant telescope built in 1918. This was the largest in the world at the time. There are also special interpretive programs at the Dominion Astrophysical Observatory. The University of Victoria is another stop. Return on the ferry to your residence. 2. Travel the beautiful Sea to Sky highway to the site of the 2010 Winter Olympics at Whistler Village. Ride the gondola up the mountain and explore the village. The highway passes many interesting geological features and we will stop at Shannon and Brandywine Falls and see the Stawamus Chief where you may see rock climbers on its world famous shear face. 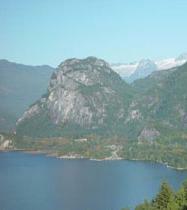 The Stawamus Chief is the second largest granite monolith in the world. 3. Participate in the amazing adventure of finding the Physics in rides at Playland Amusement Park. This is a program planned specifically for high school students and includes some wild rides. Visit Capilano Canyon and experience the thrill of the famous suspension bridge and explore the canopy of the temperate rain forest. 4. Take a sailing lesson to experience one of the West Coast’s favourite pastimes. 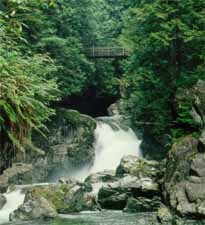 Spend the afternoon exploring the old growth forest and Lynn Canyon Ecology Centre. From the suspension bridge, observe the power of water that has carved out the canyon below. 5. 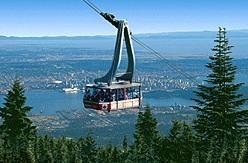 Ride the gondola up Grouse Mountain for a panoramic view of Vancouver. Spend an enjoyable time interacting with the many interesting exhibits this mountain has to offer. Visit the Seymour Demonstration Forest which has wonderful insights into the Ecology and History of the temperate rain forest. 6. Travel a portion of the Sea to Sky highway to spend a great day at the North Vancouver Outdoor School. Experience canoeing, hiking, First Nations long house, salmon hatchery and other adventures unique to the West Coast. 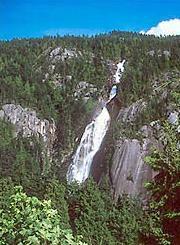 Stop at Shannon Falls and marvel at the wonders of nature.